SWAS was founded with a commitment to execellence in maintenance and service to aviation aircraft from light twin engine to multi engine turbo propeller aircraft. Expansion began in the early 1990's with the addition of avionics installation and service and a FAA Part 135 charter certificate and a FAA Part 145 repair station. We are currently working with companies such as AEROMECH and ARINC in research and development of Reduced Vertical Minimum Separation (RVSM) solutions for Hawker 700's and Lear 30/40 series aircraft. 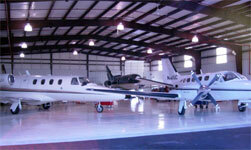 Clients rely on SWAS to provide and implement solutions for many special needs projects concerning aircraft issues. SWAS operates a FAA Part 135 air charter certification with international travel authority. Our pilots who support the charter/flight operations are all FAA certified and trained on a semi annual basis passengers to any destination domestic or internatiional.